When I received a very friendly email from Carmen at Chocri offering to send me three of their custom chocolate bars in the hopes of hearing my opinion of them, I jumped at the chance to do a review. Okay, okay, I got very excited about the prospect of free fancy chocolate and then didn’t respond to the email for months. Oops. Pregnancy does odd things to the brain. But once I started to get the hang of my new full-time mommy job, the siren song of my food blog started calling to me, and I remembered the offer. Then I jumped at the chance, and Chocri was kind enough to give me a belated shot at it. 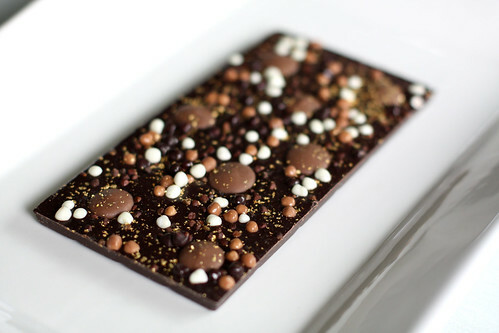 Now, I have to admit my first thought when I checked out their site (http://createmychocolate.com/) was I could make that. Anyone with a creative bent has had that thought before, whether looking at something in a boutique or magazine or online. Usually it accompanies an urge to purchase said item. But no matter how much you want it, no matter how much you acknowledge the ingenuity of the person or company who came up with it and or at least put a novel spin on it, I could make that is usually enough to keep your wallet in your purse or pocket, even when you know you never will get around to it. This entry was posted in Gifts, Reviews and tagged chocolate, Reviews on April 20, 2010 by Jessica Petersen. So, funny story…I’ve been feeling a bit under the weather the past few weeks, queasy stomach-wise. In the course of this, I developed a few food aversions. The worst of which? My own food blog. Okay, so maybe I haven’t had a food aversion to the food blog itself–after all, I haven’t figured out how to disseminate it in edible form yet. But I may have eaten a few too many of those delicious vegetarian marshmallows in the same week as gorging myself on that incredibly rich Cadbury Creme Brulegg, which resulted in my not really wanting to look at or think about sugar–unless, of course, it came in a fruit or chocolately sort of flavor. Which is a problem for a writer of a blog that focuses a lot of its attention on the pastry arts. Every time I looked at the front page, I’d have to run and get some nice, bland crackers or a brown rice cake. And just when I would think that I could get past it and write something for the blog, another comment would come in on one of the offending posts and it would start all over again. But I think I’m feeling better now, and the thought of eating a s’more only slightly grosses me out. Still, to stay on the safe side, I’m going to ease back into things with a walk on the savory side of the kitchen. This entry was posted in Reviews and tagged Pasta, Reviews on May 4, 2009 by Jessica Petersen.